Oh thank goodness this is a semi-reasonable week… in a sense of that all the dances this week were good old-fashioned ballroom dances. So how are the couples going to stack up? And I say “HA!” with the Sean / Peta ranking… that is just so wrong on so many levels, but what can I do? The other numbers in the spreadsheet are showing nothing for one reason or another… and unless I had forgotten something, ah well. *sighs* And it is another contemporary dance that throws off the predictions this week. Go figure. This time (according to Heidi’s Who is Dancing What and When) it is Aly / Mark with the contemporary routine. Predictions are slightly different this week as they are the averages of the scores from the previous seasons from the “First Third” and the “Second Third” of previous seasons. “First Third” being the first four weeks of the season and the “Second Third” being the middle four weeks of the season. You know if it weren’t for that darn Contemporary dance that Victor / Lindsay are dancing I would actually have had I would have proper rankings this time around… but as it stands we are probably going to be stuck with average scores from here on out. If I have time after work today I’ll add more to the list… but really, what’s there to say? Here you have it folks the first predicted scores of the season… You didn’t think I’d forget did ya? Well I thought I did, since I seem to have forgotten that the start of the season was today! Geez, you’d think I would have this on my calendar somewhere. So I don’t know what to do… at least at the moment. I am tempted to just do the score prediction and not even bothering with how they rank because contemporary is such an outlier and out of box concept for ballroom dancers that it just doesn’t seem quite fair. Ah well… let’s see how this first week pans out before I really throw in the white towel… I am sure in the coming weeks something will reveal itself so I could provide the best calculations I know for you guys to enjoy. Maybe I do have to include Season 15 afterall… gosh darn… it. So this is the last weekly score predictions of the season that you guys are going to get from me. Why did I wait for the instant dance to post up predictions? Simply because those are the most worthwhile to use data for. Freestyles are near impossible to predict for because of the sheer number of perfect scores or near perfect scores, it simply just isn’t worth it. The dance repeat is also a crapshoot because we have already seen the dance and the judges will either do what TPTB are whispering in their ears or they will go off script and be even stranger… who knows. What I did notice though is that the scores of contestants in the finals tend to give the viewer an idea of how TPTB are trying to even the playing field. By giving Shawn / Derek a far lower score than the other two it is as if they are compensating from the sheer volume of votes they are getting in comparison to Melissa / Tony or Kelly / Val. But this is speculation and I don’t have the date to prove or disprove anything… yet. So that leaves the instant dances. Granted they will not be exact and I really wouldn’t be surprised if let’s say Shawn / Derek and Melissa / Tony would get close to perfect scores with Kelly / Val bringing up the rear so that the winner will be just down to popular vote. 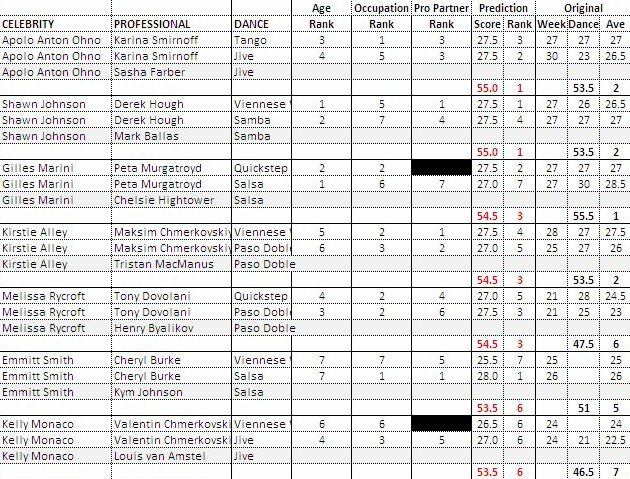 But enough speculation, below is the table breakdown of the final three and how their scores appear to pan out for the three possible dances (Samba, Cha-Cha, and Jive). Oh Em Gee… Week Nine? The Semi-Finals and we have five couples left in the competition? It is interesting to know that in a week it is the finals and then we have to wait til March for the new season of Dancing with the Stars. Not a bad thing mind you but… anyway. If the predictions are to be believed (and the score from approximately the same time frame in the original seasons) then the top three couples would include Shawn/Derek, Apolo/Karina and Melissa/Tony which would be just fine by me (and probably most other people). Now for the eighth week of competition in Season 8: Melissa originally received a 21 because she was injured that week and as thus her score was based off of the dance rehearsal footage taken earlier that day (or weekend). I find it rather interesting that Emmitt is the only one that has not done either one of the dances that he is assigned this week in his original season. Kelly Monaco did the Viennese Waltz as a group dance in her season but it was not scored. Yes I know that Kirstie has done the quickstep below… however aside from Season 15, has anyone in their 60s completed the quickstep in the latter part of the season? From what I have been able to see I do not believe so… but I am only human. Week 5 no eliminations… while as with Week 6 we were suppose to have a double elimination but it would appear that TPTB have scraped that idea and we will see a single elimination this week. 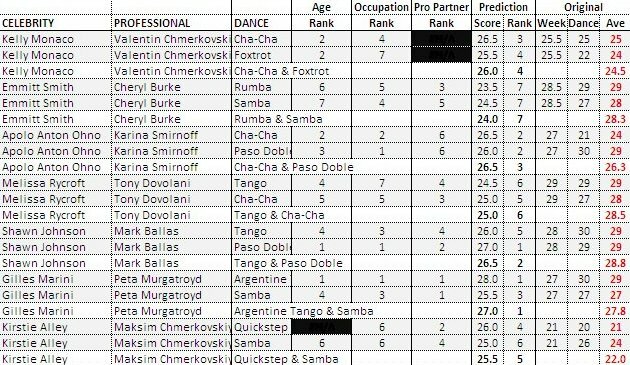 That being said… thanks to Heidi for posting up the “Who is Dancing What” post for the week… what does the data say about how the couples will be scored this week? Better yet, will there be any change / shake up in the standings from last week to this week? Before going on let’s look at how the scores could stack up if Week 6 did NOT have Week 5 added on to it. – Since we are in Week 6, the calculations above is strictly based off of scores from Weeks 4 through 7 in a traditional 10-week season. Just to keep the scoring semi-reasonable. – Although Apolo Anton Ohno has a score from his original season for the Viennese Waltz… in actuality he has done the Waltz in his season and did not dance to the Viennese Waltz. – Does anyone else find it odd that Derek – until this season – has never done a Cha-Cha between Weeks 4 through 7? Now let’s look at how the scoring went down in Week 5 (including the Team Dances). As you probably deduced all on your own, Pam and Tristan are in real trouble. The judges were absolutely right when they called her out on her lack of preparation – seems clear they are paying attention to studio time this season, like they have occasionally in the past, and it’s going to be noted if you don’t do well AND you weren’t putting in the time. It’s the All Star Season. It’s to be expected. I could go on but I won’t. You get the picture. The only one of these that I could see happening is Melissa or Helio…with an outside shot of Drew. I don’t think that Pam has the juice to get past either Bristol or Kirstie….or Joey….but I’m going to say right now that Melissa and Helio could be surprises. If there is such a thing as a surprise elimination this season. This is where I’m less sure. I don’t know if Bristol has it this season like she did in her original season. These are the all stars! !